Like many pioneering Colorado companies, Livliga is the result of a personal struggle-turned-passion for founder and CEO Sheila Kemper Dietrich. Recognizing the need to “right-size” the food environment, Kemper Dietrich turned her desire for a healthier lifestyle into the development of discreet and artfully designed portion control products. 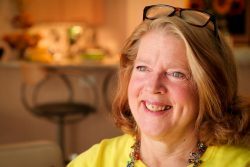 Prior to launching Livliga, Kemper Dietrich was the executive director of the American Heart Association in Denver, where her awareness of the health risks of obesity and related diseases was illuminated by startling data. Research shows that genetics aside, an overwhelming percentage of our health issues are caused by lifestyle and are otherwise preventable. Statistics like these led Kemper Dietrich to write a white paper discussing the role of science – specifically visual illusion – in tableware design and the perception of size. “Mindfulness about food has been abandoned in our culture and we are unaware of serving size. A portion can be any number of servings. If we right-size our eyes, we right-size our portions,” said Kemper Dietrich, and thus Livliga was born. Founded in Boulder in 2011, Livliga is now in its fourth year of product sales. Kemper Dietrich credits Colorado’s entrepreneurial culture for much of her success. “People here, in Boulder especially, are willing to make themselves available and give their time and intelligence to helping me develop my business – providing input on everything from pricing to distribution,” said Kemper Dietrich. Local resources like the Boulder Chamber of Commerce and public library provided a venue for meeting mentors, access to business classes and research tools. Kemper Dietrich now offers her own expertise giving healthy lifestyle classes at the YMCA, and providing menu planning and recipe guides designed to help people get started on the journey to healthier living. From the early encouragement of Kemper Dietrich’s American Heart Association board, to a chance meeting with Governor John Hickenlooper at a Rotary Club lunch that led to a letter of support, the feedback has been resoundingly positive. Livliga’s award-winning tableware is not simply smaller; it utilizes unique VisualQs philosophy. For example, a dinner plate includes a wide rim which encloses measurements based on USDA recommendations for specific foods including fruit and vegetables, starch or grains, proteins, even a measurement for dressing or condiments. The product line has grown to include glassware, serveware, pet dishware, a children’s line and a brand new bariatric line. Livliga is now expanding into international markets including interest from Kuwait, Peru and Japan. Livliga products can also be found closer to home at the Longmont Ace Hardware and Louisville’s The Singing Cook, with the hope to add more gourmet retailers in the future. “The sky is the limit. I would like to be the Martha Stewart of heathy living,” said Kemper Dietrich. Livliga accomplishes all this with just two-full time employees and a team of 10 virtual consultants who assist with aspects like design, social media, packaging and marketing. As the company grows Livliga looks forward to expanding the team. Livliga is the Swedish word for lively, vibrant and vivid. “This is what we wish for your life,” says Kemper Dietrich.